Recently I made these dark chocolate mocha cupcakes to celebrate the new season of one of my favorite TV shows, Falling Skies. I really wanted people to like these cupcakes, even if they haven't seen the show, so I focused a lot on the flavors and decorations. 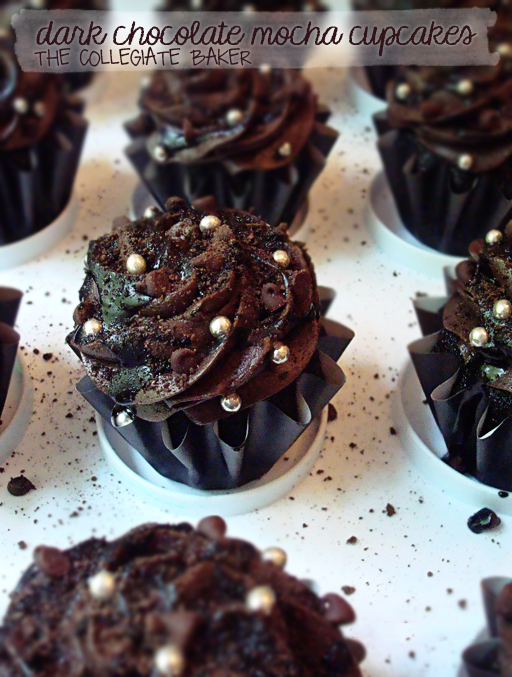 They're dark chocolate cupcakes with dark chocolate mocha frosting and dark chocolate glaze. So if you like the dark-chocolate-mocha flavor combination, you should check out the whole post on The Collegiate Baker! cupcakes dark chocolate dark chocolate cupcakes mocha mocha frosting.